 Greenberg (Race Relations in American History, not reviewed), former head of the NAACP Legal Defense Fund, recounts the revolutionary and riveting saga of the fight for civil rights in the 1950s and '60s. The author discusses how he, a Jew from the Bronx, dedicated most of his professional life to the advancement of civil rights for blacks. In an expressive and often humorous style, Greenberg recalls the days of segregation, when black and white civil rights attorneys often feared for their lives. The book's strongest points include a full, human portrait of the late Thurgood Marshall, who headed the LDF prior to becoming a federal judge and then a Supreme Court justice. 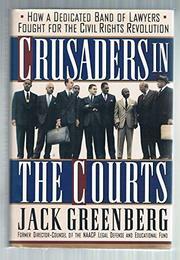 Greenberg brings many of the characters involved in the civil rights struggle to life with personal anecdotes while explaining the issues of constitutional law in a way that laypeople can understand. He provides perspective on the role of Jews in the civil rights movement, saying that it has often been overstated. His account of the drama leading up to the Brown v. Board of Education decision is particularly compelling. He also does not hesitate to criticize President Eisenhower for, in his view, failing to provide strong leadership in integration. Greenberg fully grasps the irony of a protest aimed at him when he was asked to teach a civil rights course at Harvard: The Black Law Students Association there objected to the notion of a white man--also a Jew--teaching such a class. Greenberg, who went on to teach law at Columbia, is neither self-righteous nor sanctimonious as he delineates how legal changes engendered by the NAACP LDF affected daily life in America. Yet, despite past victories, he is only too aware of the continuing, desperate plight of the African-American underclass.